Update: May 7, 2016 - All the puppies are sold. 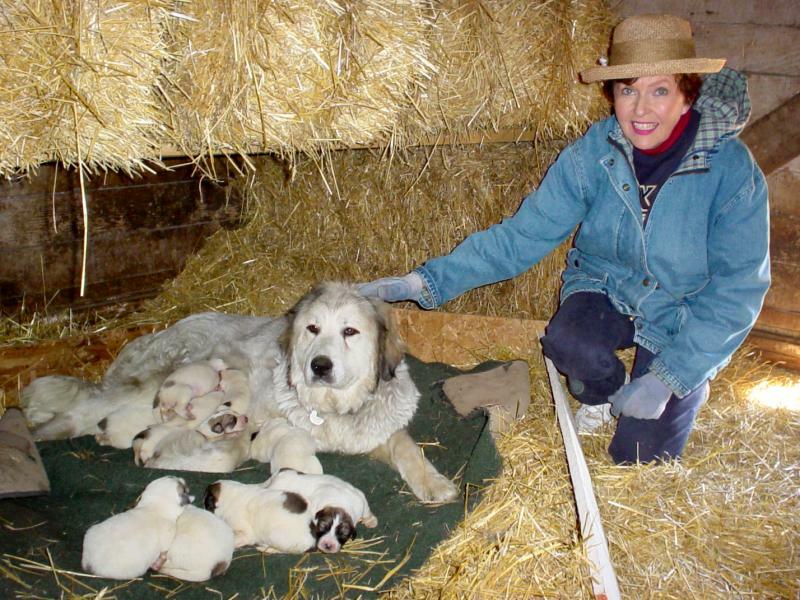 We have seven badger-marked and white Great Pyrenees puppies! They were born to Mocca and Boaz in March. They will be ready to go to their new homes in eight weeks. Email or call Sarah for more information. 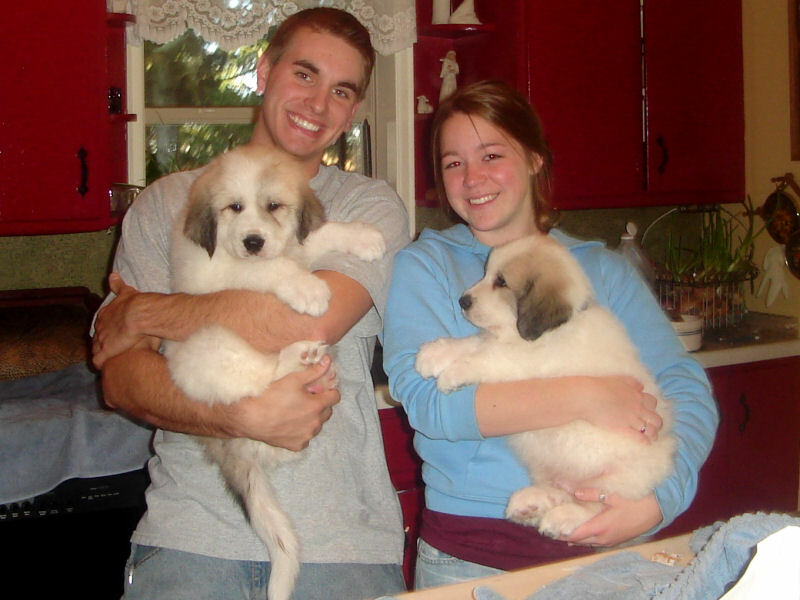 One male and two female Pyr puppies born to Mocca and Boaz in March have begun training in "multitasking." They are being socialized in the house and love to be petted by old and young alike. All three of the pups have mellow personalities and are learning house manners. For their other task, they are in guard training outside with our sheep. 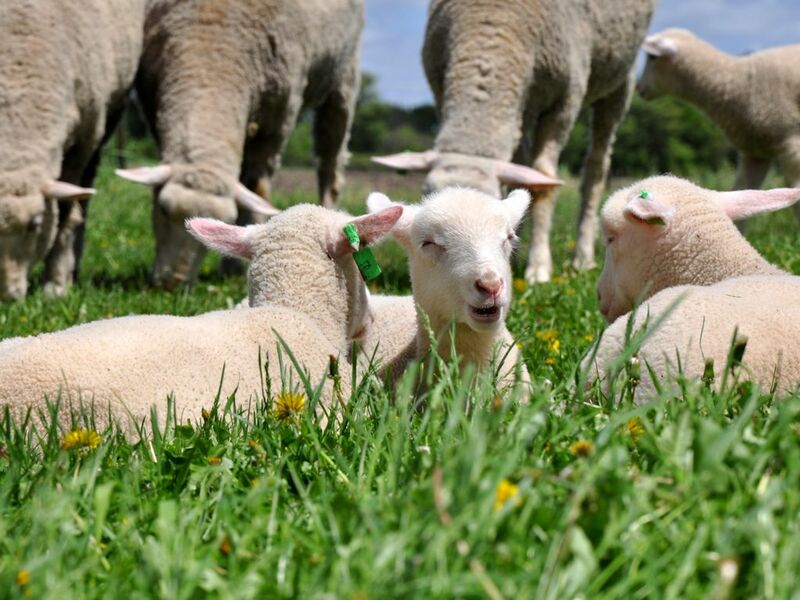 They are bright and alert and watch their parents guard our flock. The pups will learn by observing the older dogs. 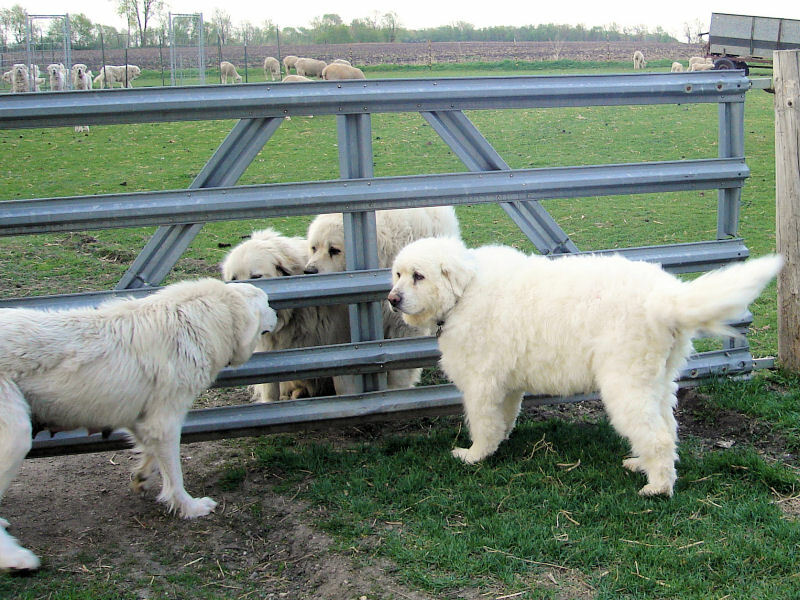 Of course, the pups get to observe the sheep from the safety of a kennel fence. They need to be protected from being butted by an over protective ewe. 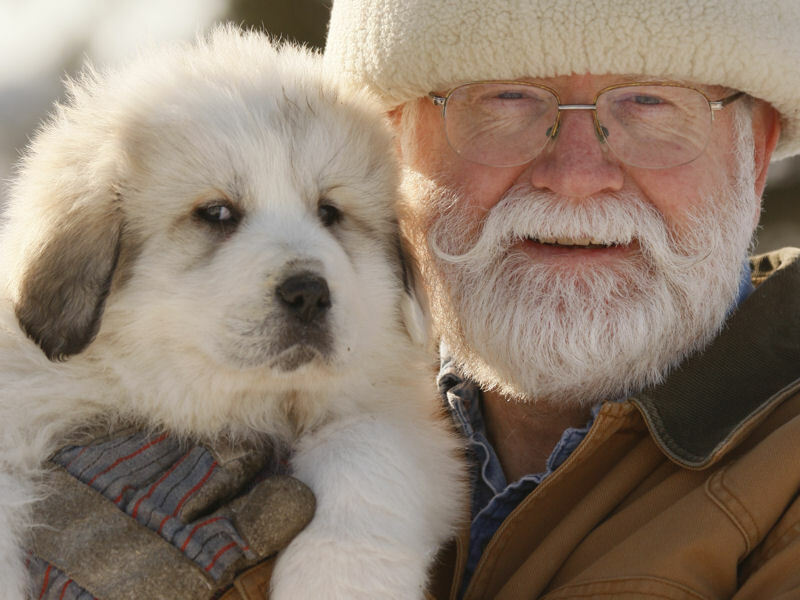 Many of our puppy buyers are looking for a pet, who is also a guardian. Our Pyrs fit that description. By the time these puppies go to their new families, they will be accustomed to people and to livestock. The male puppy is sold and is waiting for his new family to pick him up. The two females are available. Call 320 286-2865 for information and puppy news. Click here to read the amazing story of how the Lord healed Bella. I like to walk my dogs. It is always hard to decide which one will go to Collingwood park and walk the trails with me. The issue has been solved by taking four at a time. They walk well on the leases—no pulling or straining. Pilgrim, the poodle, leads the way. He stays out in front about three feet ahead of “the girls”. Our lineup looks like this. Pilgrim is first and he prances boldly ahead. Holding the leases, I am next in line. On my left side is Jessie. Right behind her is Josie. Bella is in the back, guarding the rear of the parade. It is fun to see the expression on other hikers at the park. 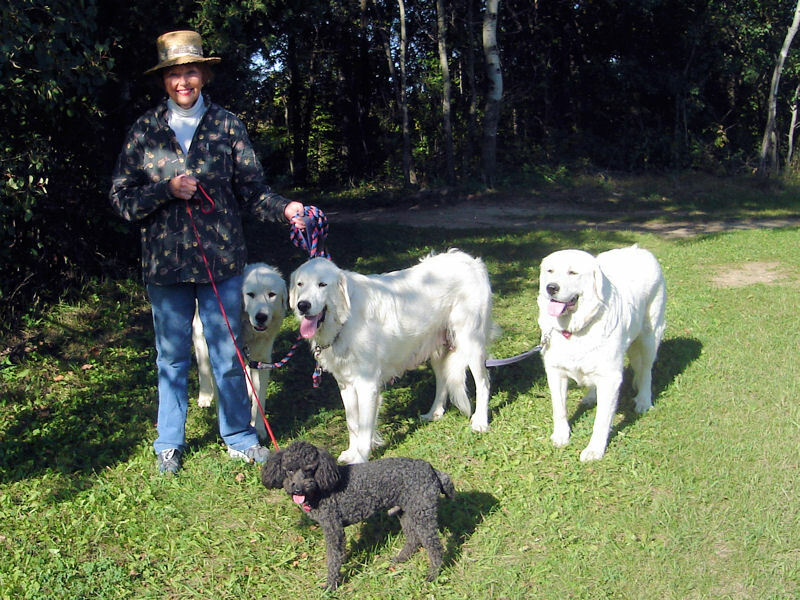 My Prys are well behaved and do not jump or bark at people—but they are BIG! Sometimes, I walk on the highway out in front of my house. Since I started taking the dogs with me, everyone that goes by smiles and waves at us. They did not smile or wave when I walked by myself. I do not think that they even saw me. Now that I take the dogs, we are hard to miss! When we arrive back home, the dogs get a treat. The treats are usually a raw egg each or a handful of dog biscuits. They like this part of the walks. BATH DAY for Molly and Baron’s puppies was an event!!! My helpers from the big city came out to scrub and rub, hold and cuddle, brush and comb the puppies. The pups even got their ears cleaned out with Q-Tips dipped in peroxide. Everyone had fun, but I believe that the human helpers enjoyed it more than the puppies. Sarah talks about the four-week old puppies from Asher and Josie. They are in the house which is a little scary compared to the friendly barn and its -10 degree temperature. You'll need a high-speed connection to view this video and either Windows Media player or Real Player. Here's Ginger's and Baron's July 2008 relaxing with mom on a hot day. You'll need a high-speed connection to view this video and either Windows Media player or Real Player. Down on the farm video. 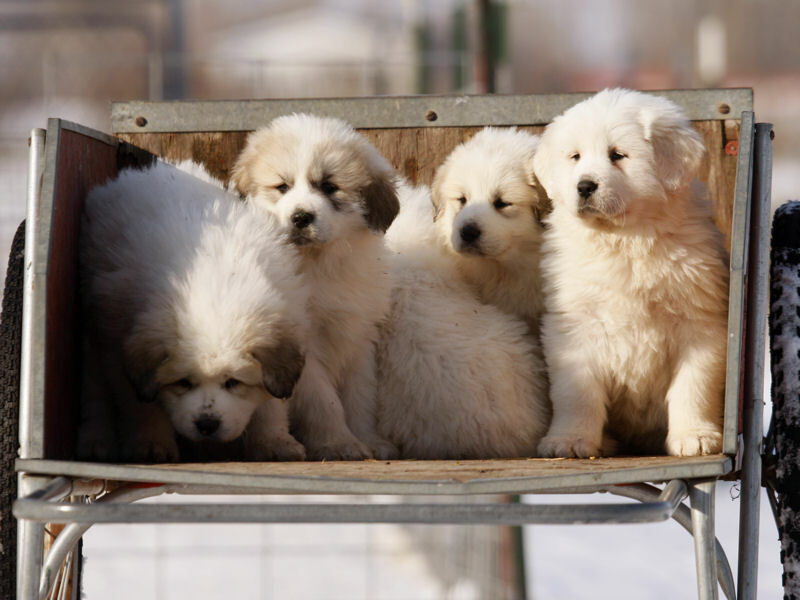 See the Pyr pups in action as they gather around Sarah seeking attention. You'll need a high-speed connection to view this video and either Windows Media player or Real Player. 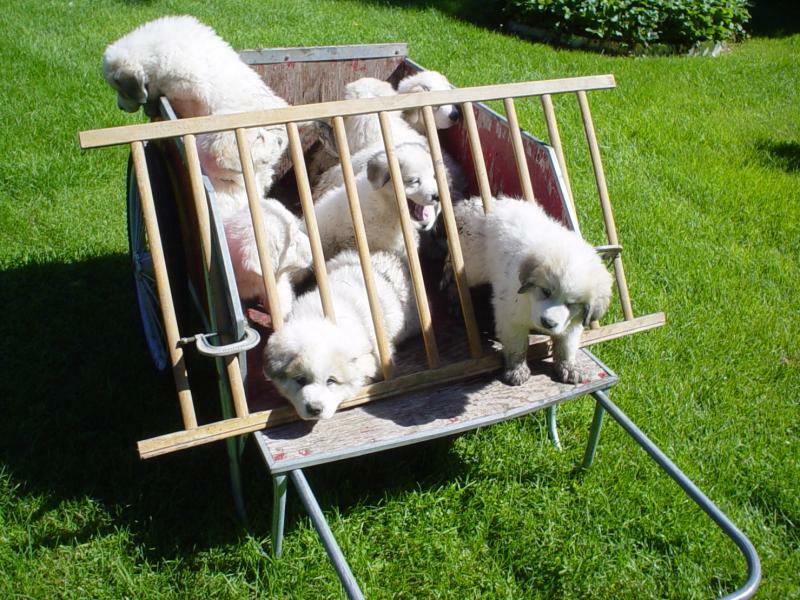 At six-weeks of age, these pups weighed between 15 and 20 pounds. Besides the normal wrestling among siblings, they are curious about new things and are interacting with Sarah. 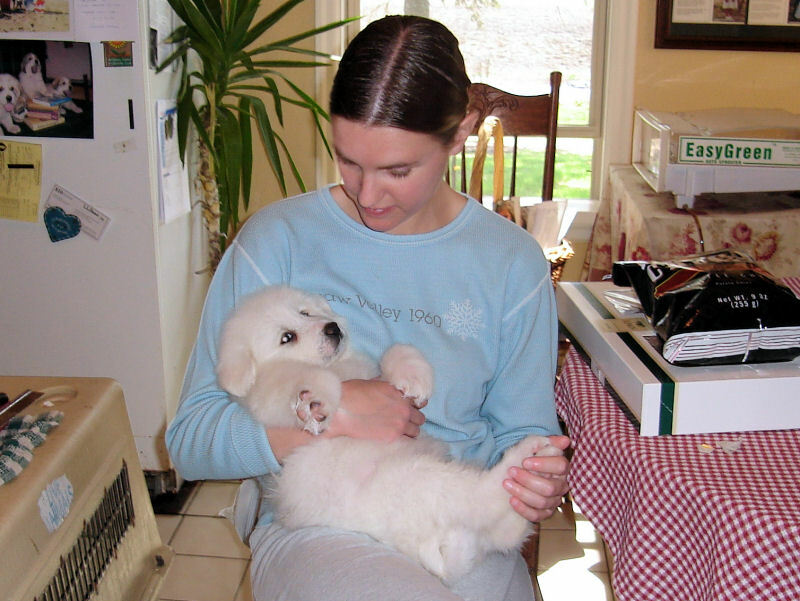 Pyrs bond to their owners and become like family. 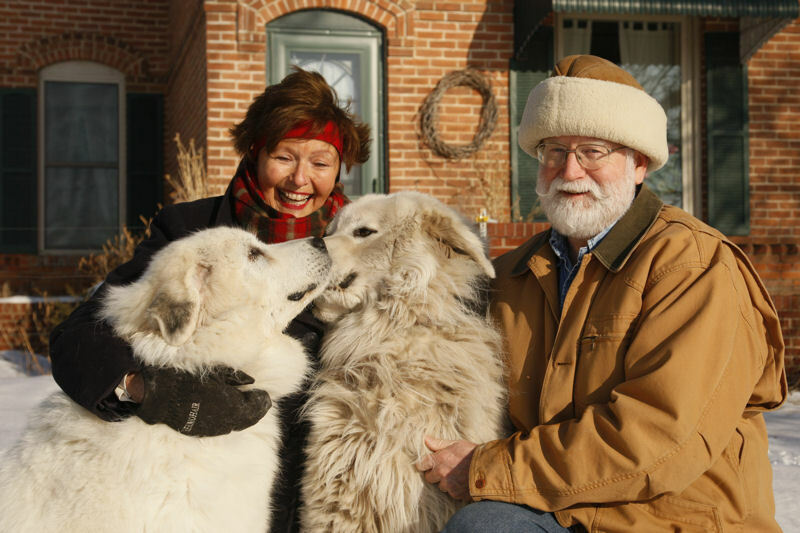 These puppies' parents, Boomer Bear and Molly Brown Bear, are registered with the American Kennel Club. On the right, a white and a badger-marked pup pose for a picture. 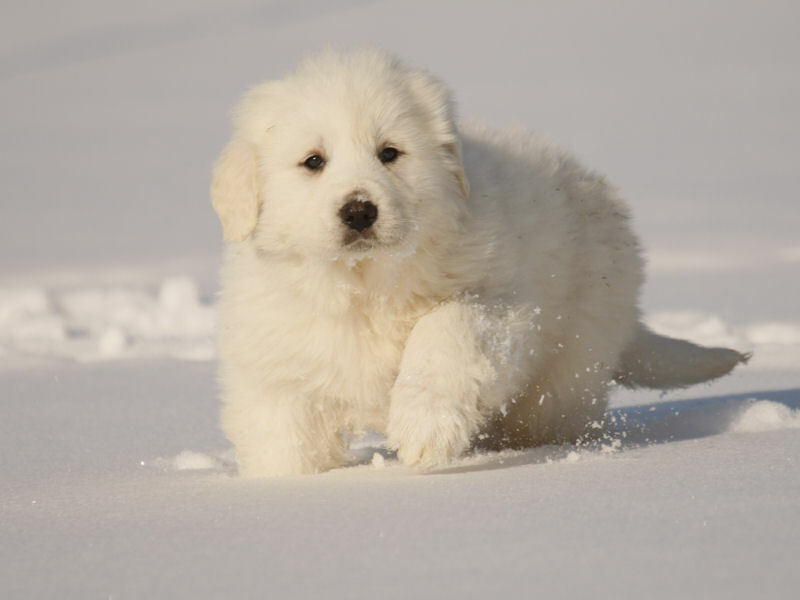 We sell puppies across the nation and guarantee the health and genetic qualities of each pup. Good nutrition and exercise for the male and female ensures strong healthy pups. Our adult dogs tend to be larger and heavier than the norm. 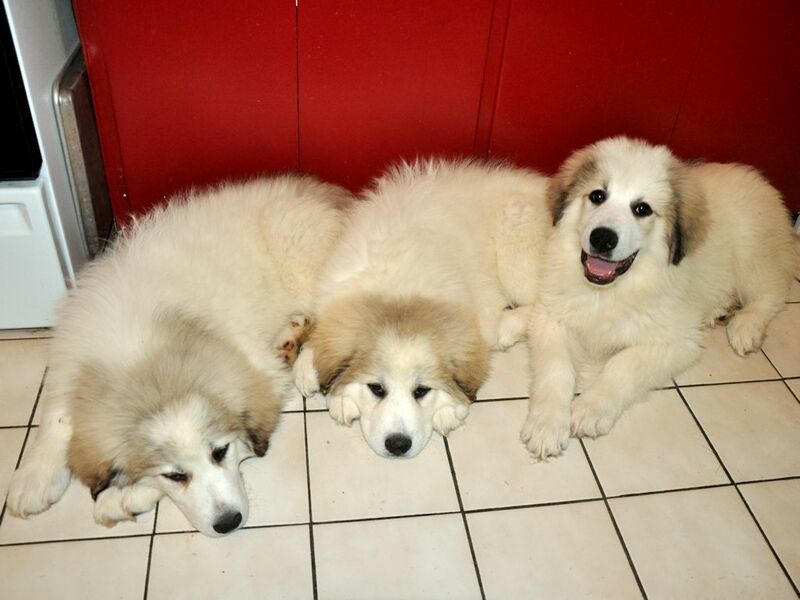 Adult males: 115 - 130 pounds Adult females: 90 - 120 pounds. Our oldest male, Boomer Bear, out for a walk with Sarah. All our adult dogs are trained to follow verbal and hand obedience commands, as well as having good house manners. All will do basic commands such as come, sit, down, kennel (go to kennel). We think it is important for a new owner to understand how the dog thinks of itself and its relationship to the owner. 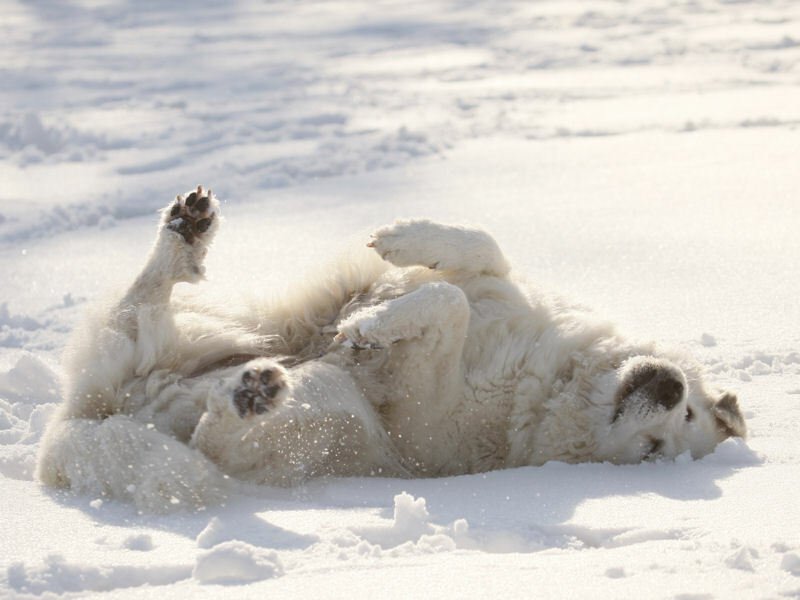 Pyrs tend to be independent and need to know that the owner is the "alpha dog." We spend time with each new owner showing how to train and care for their dog. 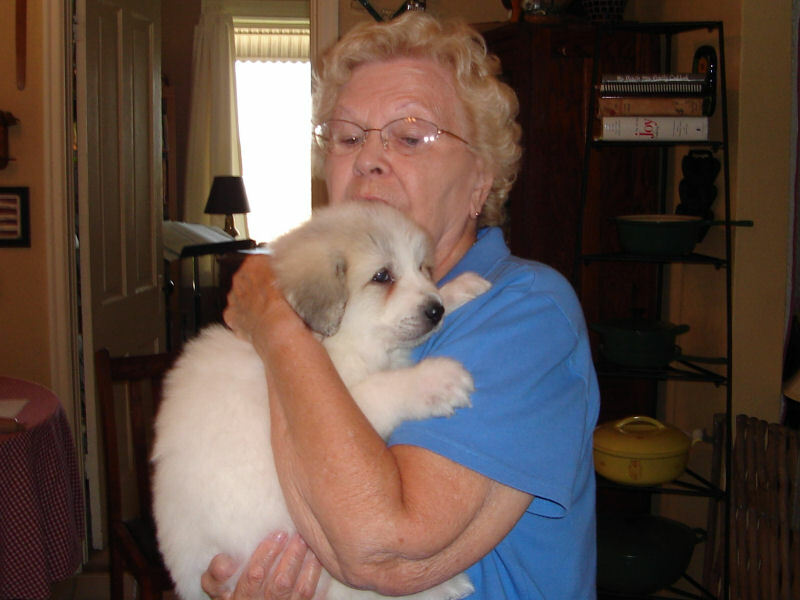 Great Pyrenees like our female, Honey Bear, are sensitive and gentle in their behavior toward even the smallest child. 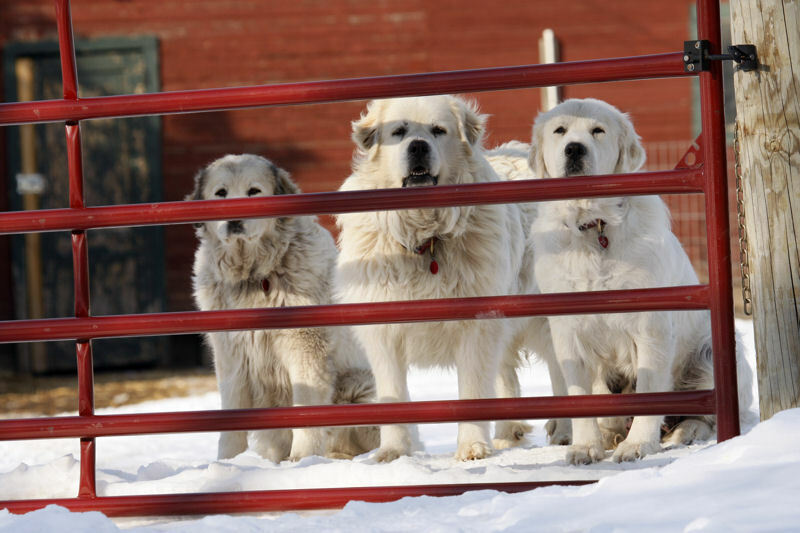 Our Pyrs guard our livestock and property as well as being loving pets. The "gentle giants" keep our farm predator free. 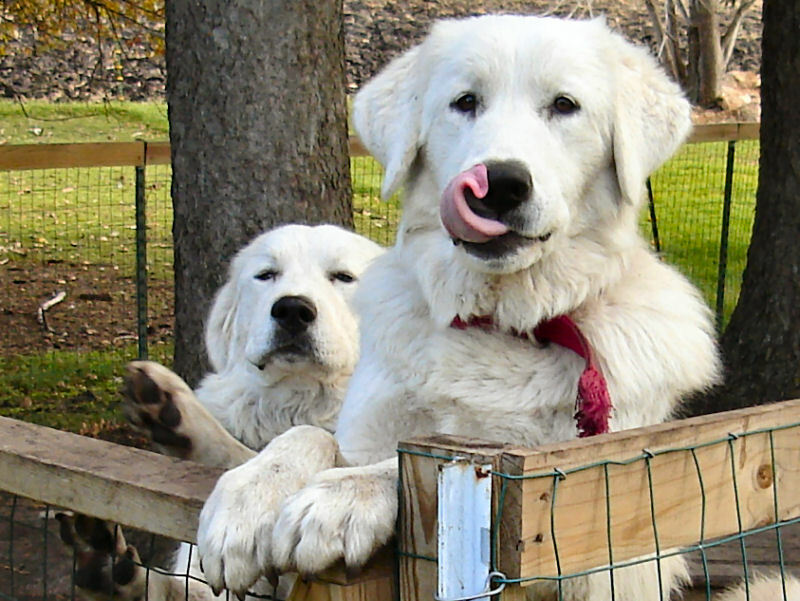 Pyrs are the most effective way to keep coyotes and dog packs away from sheep, goats and cows. Though some of our neighbors have had losses, we do not lose sheep, chickens, ducks and geese to predators, thanks to the Pyrs. Our dogs are working dogs rather than show dogs. 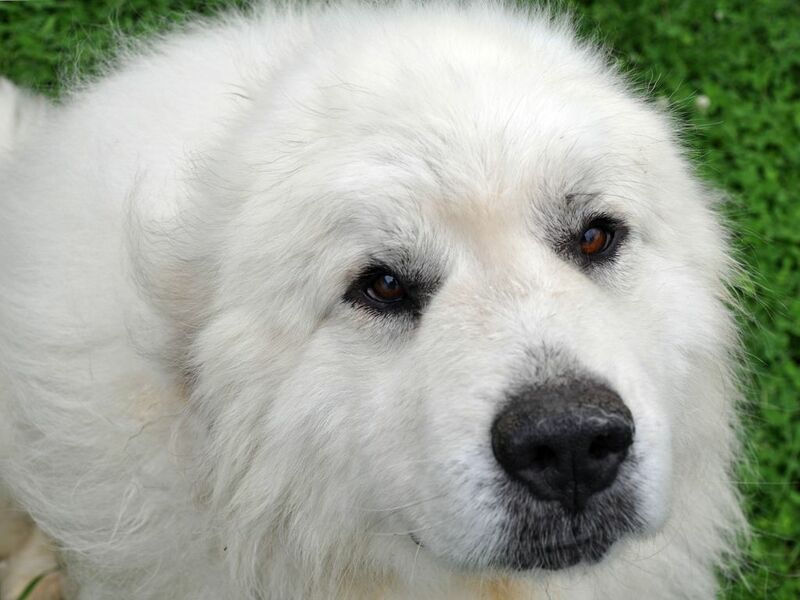 Boomer was bred from goat and cattle guarding Pyrs in Missouri. His territory includes the barn and the pasture. He patrols the fence line and then parks himself close by the grazing sheep where he can keep an eye on things. His thick two-layer coat keeps him warm in our cold Minnesota winters. Sarah is posed with Baron, our new male pup from Texas. He comes from cattle guarding AKC parents and is a welcome addition to the pack. The next picture is Baron at one year, along with Honey Bear and Kodi. They are inside our alternate pasture for the sheep which formed by an electric fence. 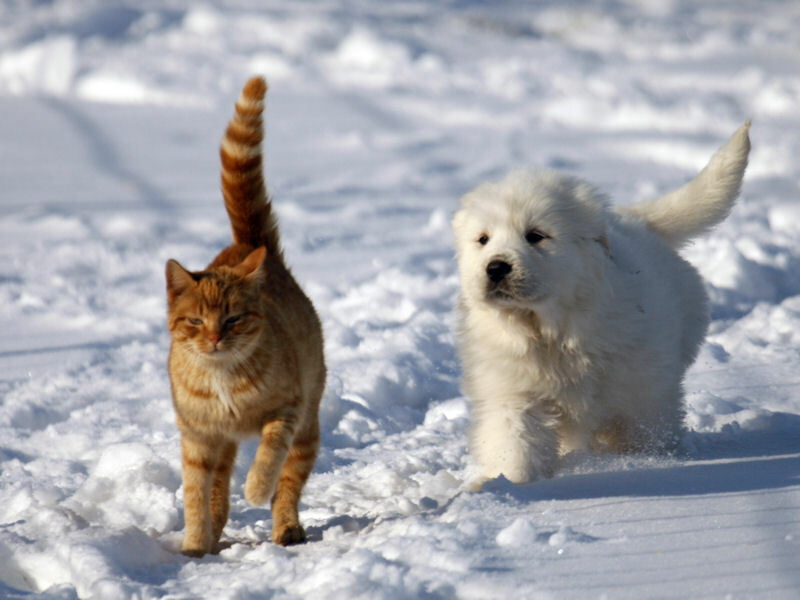 Because of the closeness of the highway, the value of the dogs, and our need to control breeding, we do not let the pyrs loose unsupervised. The pastures provide large areas for them to exercise and perform their guard duties. Here, Honey Bear on the right, Boomer and Kodi, look at Jessie who just came over for a chat. Jessie is the youngest and note her submissive posture. We've had a lot of rain, so these puppies have discovered mud puddles. To move 120 pounds of muddy cannines to a dryer spot, I had to improvise for the seven-week old pack. Jessie and Josie lick their chops when Sarah approaches with doggie treats. 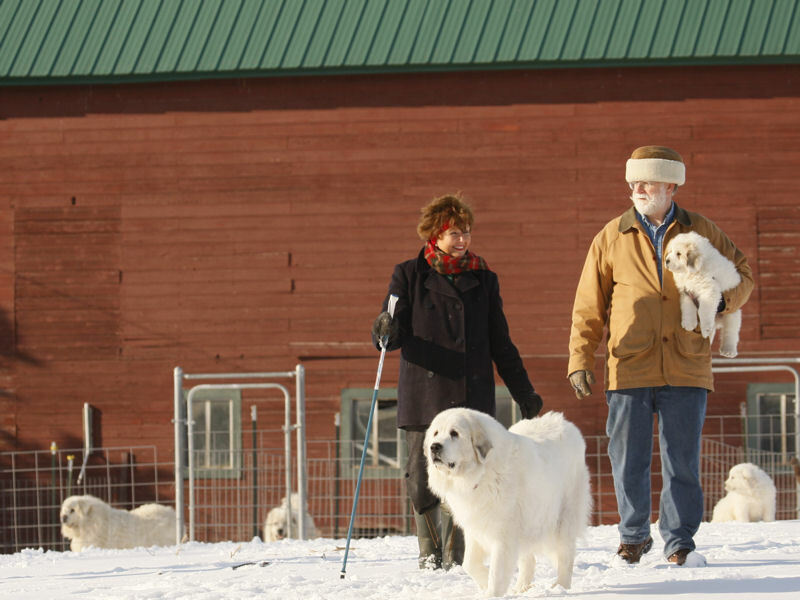 Sarah makes her rounds daily to visit with each dog and practice their training. Often she takes the younger dogs out on the leash for training to the fence line. Sarah has been experimenting with organic dog food recipes. From the attention given by Molly and Baron (left), and Boomer (right), she might be close to the final product. Thanks to professional photographer, Mitch K., for these great pictures. The big day is almost here. The Pry puppies are getting ready to go to their new homes. It is a busy time for me at Milk and Honey Farm. The puppies will be wormed with Nemex 2, and receive the first series of their puppy shots. We use Canine Spectra 7. It contains canine distemper-adenovirus type 2- parainfluenza-parvovirus vaccine, modifified live virus, and Leptospira Bacteria. We recommend to all our new puppy owners that they take their puppy to a vet to maintain the worming and shots program. 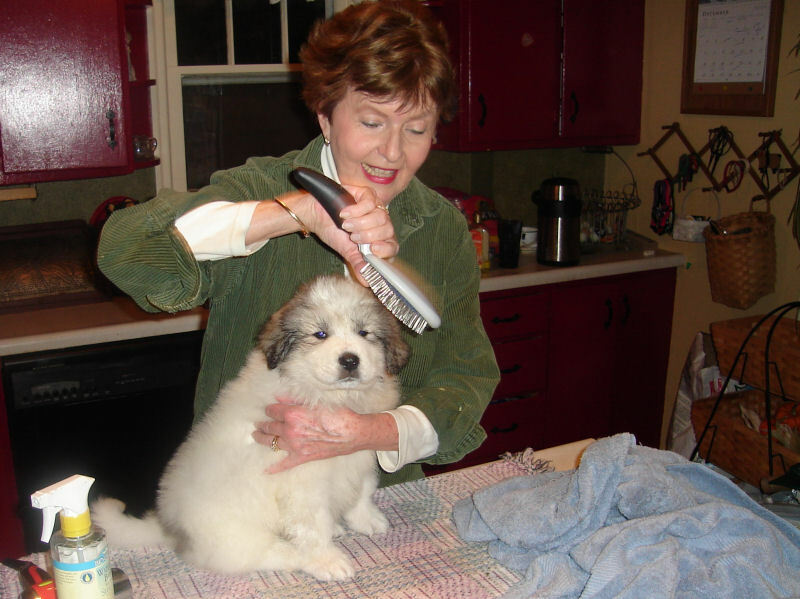 In addition, the puppies will have their toe nails trimmed. 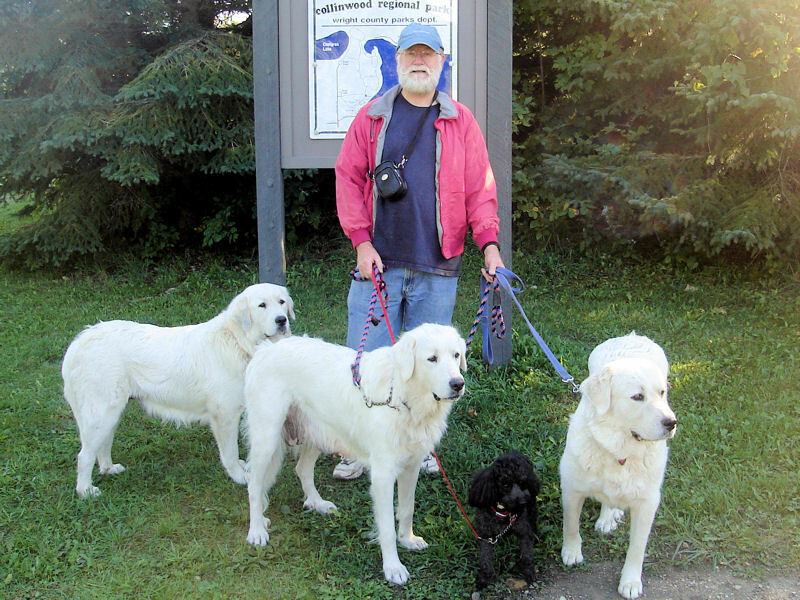 Bob will explain to the new owners how to trim the dew claws when the pups are picked up. Then, there is the BATH! This is always an adventure, both for the puppies and for me. I use Johnson’s no tears puppy shampoo, lots of warm water, and a mild vinegar rinse. After a complete scrubbing, from top to bottom, the pups are towel dried. Then comes the part the usually do NOT like—the BLOW DRYER. When they are completely dry, I begin the combing and brushing. They like this and look like little fluffy bears when I am finished. The challenging part of this entire procedure is to manage to keep the puppies clean until they are picked up by their new family!!! Volunteers make my life easier at busy times on the farm. Preparing eight Pry puppies to go to their new homes is one of those times. The process includes puppy shots, worming, nail clipping, and the first serious bath. The bath is one of those times when the volunteers make a huge difference. 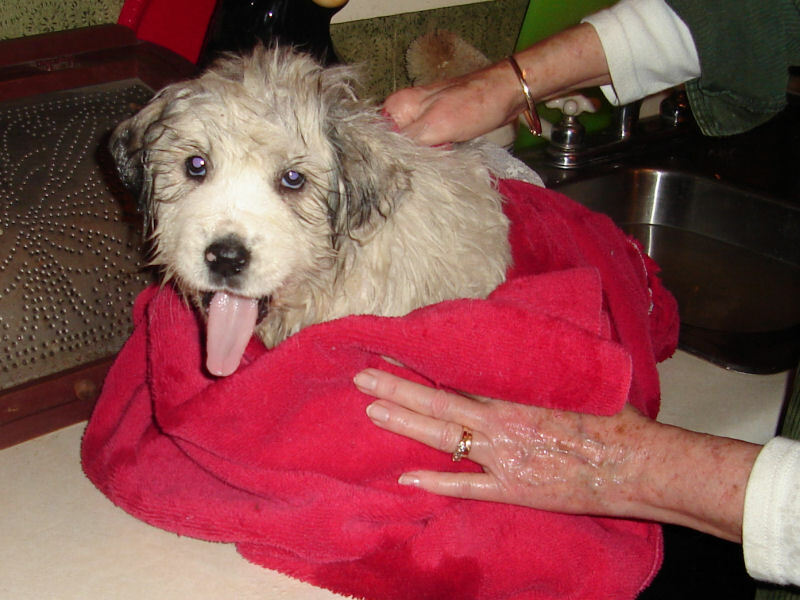 The “Puppy Brigade” helped with baths for Jesse and Barons pups. 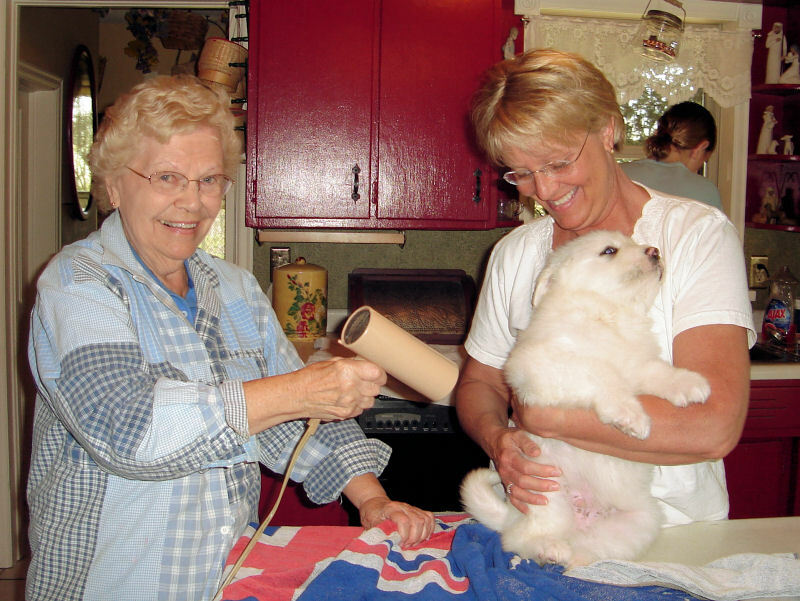 There were three generations of puppy scrubbers, dryers, and brushers. They scrubbed with shampoo suds, and then rinsed with a vinegar water solution. The next step was towel drying and then on to the blow dryer. The last step was brushing, combing and fluffing. This whole process included a LOT of puppy cuddling and petting. We had a wonderful time, including a delicious lunch. (They even brought lunch) These puppy helpers are the very best of FARM VOLUNTEERS. I am grateful! 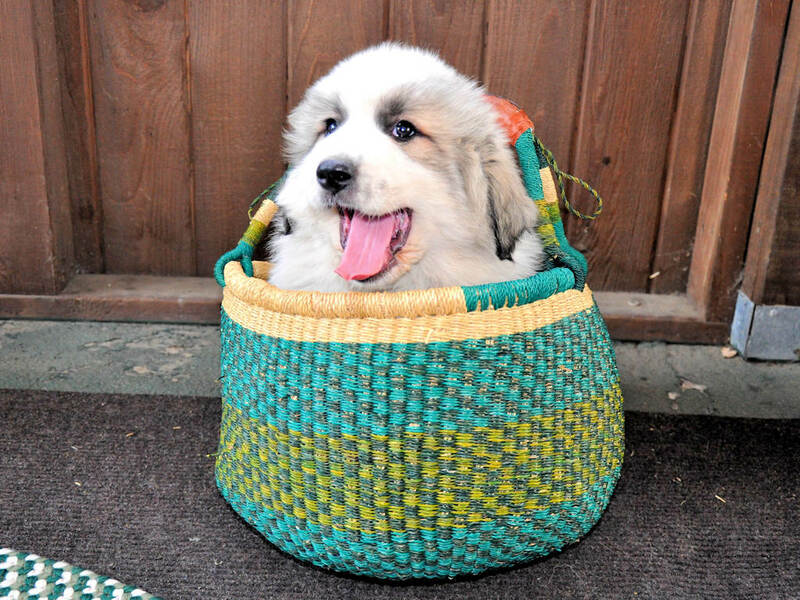 Here's their Pyr. 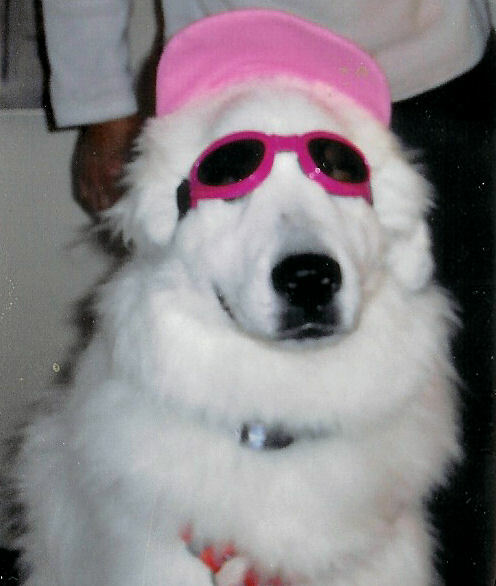 Pyrs like Hattie are cool!